It was a day full of action for the crowd at the 2016 J-Biz Expo and Business Conference, held in New Jersey. It was a day full of action and opportunity for the crowd at the 2016 J-Biz Expo and Business Conference, which was held on Wednesday at the New Jersey Convention and Exposition Center in Edison. A diverse crowd of men and women can from far and wide – throughout the United States and around the world – to enjoy the Jewish community’s premier B2B event. In the eight hours between when the doors opened and the Expo’s grand finale concluded, countless promising relationships formed, and invaluable guidance and resources were taken advantage of. You could not help but be amazed at the speakers lineup at the morning business conference. Marketing guru Rabbi Issamar Ginzberg delivered a slew of practical tips on how to make a successful sales pitch, both in person and through advertising mediums. The legal panel with prominent business attorneys E. David Smith Esq. and Dror Futter Esq. followed. The attorneys shared their experiences on how proper legal and accounting planning increases a business’ value and prevents many headaches, and fielded audience questions. All eyes were on stage when Jason Dov Greenblatt, Executive Vice President and Chief Legal Officer of The Trump Organization, shared his experiences leading to his current position. The frum father of six and leading advisor on Israel and Jewish community issues discussed his experiences advancing in the business world and expressed his admiration for his boss, GOP presidential candidate Donald Trump, and Mr. Trump’s children. He then fielded audience questions during a Q & A session moderated by Dr. David Lieberman. Duvi Honig, founder and director of the Orthodox Jewish Chamber of Commerce and J-Biz Expo, presented an award to Mr. Greenblatt for his efforts on behalf of our community’s economic issues. Mr. Honig and Mr. Greenblatt have worked closely together in recent months. The final speaker of the business conference was Kivi Bernhard, a fixture at elite business events throughout the world, delivered a riveting keynote address elaborating on his unique “Leopardology” business philosophy. The frum native of South Africa explained the successful predatory practices of the African leopard and how that translates to business. His address was peppered with fascinating anecdotes of how he built his diamond business from scratch. Following the conference, throughout the afternoon, the main J-Biz B2B expo floor was rocked with energy and person-to-person networking. A long list of businesses, ranging from major banks and credit card companies, to innovative community based businesses of all sizes, featured attractive booths showcasing their services and offering souvenirs to attendees. 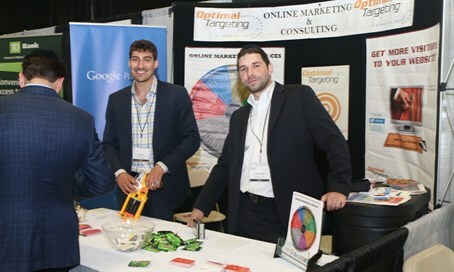 Exhibitors spanned the gamut of services that individuals and businesses in all industries can enjoy: marketing, accounting, E-commerce, educational, real estate and construction, media, transportation, business coaching and more. In addition, while the B2B networking was on going, there were intriguing live business game shows, professional workshops, and a Women in the Workforce panel, taking place. The grand finale of the event was “The Accelerator” investors panel moderated by Shea Rubenstein, where four lucky entrepreneurs from New York, Lakewood, Toronto and Israel presented their innovative new products onstage. They were questioned by the four “sharks” - seasoned investors Morton Davis, Rabbi Gedaliah Weinberger, Danny Lemberg and Gershon Bassman – who discussed potential long term investment and partnership.